No, I did not use this in time. Please don’t judge me. 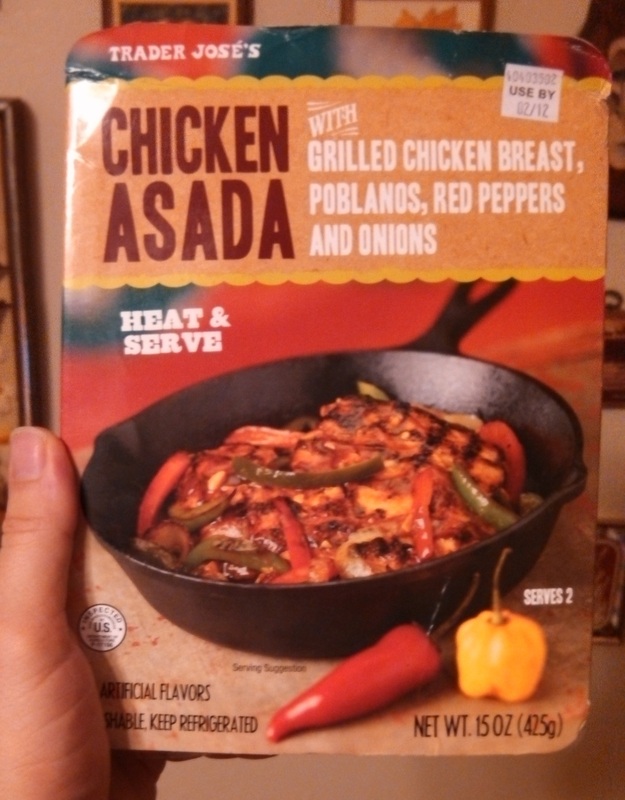 Trader Joe’s Chicken Asada with Peppers and Onions is a twist within a twist. The classic asada, the asada we’re most likely to meet out in the world, is of course carne asada – a beef dish. Trader Joe’s confounds these classical notions with a chicken dish of pollo asado and, not content to simply flip the script once, flips it again by marinating the chicken in a pineapple juice marinade. The result is a citrusy, savory, colorful main dish that will satisfy every bit as well or better than any mere carne asada. 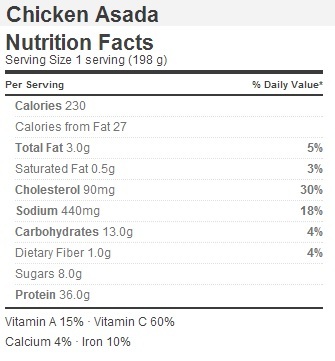 Let’s talk asada. The term, I am informed by my vast knowledge of where to translate words on the internet, literally means “roasted” or “grilled”. Now you and I and anyone else who lives south of the 40th parallel knows that this term is encountered nearly exclusively with carne – aka beef. Specifically marinated beef. Exactly what form that beef is going to take, on the other hand, is anyone’s guess. As a rule you can expect long, thin strips, though you’re just as likely to end up with mince meat or a single giant block. Like barbecue, the only real rule is that it’s beef and that it’s been seared to hell on a grill. And, of course, that it gets served up with some sort of vegetable or another. So it was with considerable curiosity that I picked up the chicken “asada” – or more correctly asado. Could chicken be as good as beef? It certainly can, and in this case it certainly is. Though it lacks the sinewy tenderness you might expect from a good bit of roast flank steak, you’re still getting a nice, juicy slice of flame grilled chicken that locks in that barbecue flavor. Even better, it brings that wonderfully lean nutrition that chicken is famous for – satisfying the health conscious with its rock bottom 3 grams of fat per serving. Now as exciting as chicken is by itself, what really caught my attention in this dish is the unusual marinade. Pineapple juice is the base, seasoned with garlic, chili powder and coriander. Now it’s not unheard of from lemon juice to go into your carne asada marinade, but this is generally a highlight, not the base note. Here the pineapple flavor is unmistakable, and when coupled with the hints of coriander you might be left wondering if you’re eating a Mexican dish at all, or if you got a box of mislabeled Indonesian food. If it wasn’t for the fact that Trader Joe’s Chicken Asada goes so well in a fajita, I’d probably make a bigger stink about this flagrant flaunting of traditional labels. As the case stands though, the sweet, citrus vibes and subtle smoky flavoring of the other spices do an amazing job spicing up your otherwise staid and ordinary fajita/burrito/taco. Complimenting the chicken is a reasonable serving of sliced, grilled onion, poblano pepper, and red bell pepper. Nothing too crazy about these suckers – just your regular veggies soaking up the unusual marinade. If you decide to microwave this dish, just be sure to keep an eye on these guys. I found that even after nuking them for the upper time limit given the veggies were still a little tougher than they should have been. Overall, this is a very good dish, and certainly one worth checking out, just so long as you don’t think of it as an ordinary carne asada. Would I Recommend It: Sure, it’s tasty and a little different. Would I Buy It Again: This could become a staple of Mexican food night around my place. Final Synopsis: A lean, citrusy alternative to traditional carne asada. Thanks for this review. I have never bought this, but I may get it next time I have a hankering for lazy Mexican food. Looks like it would go great inside a crispy taco shell. Trader Joe’s in SoCal no longer carry it.